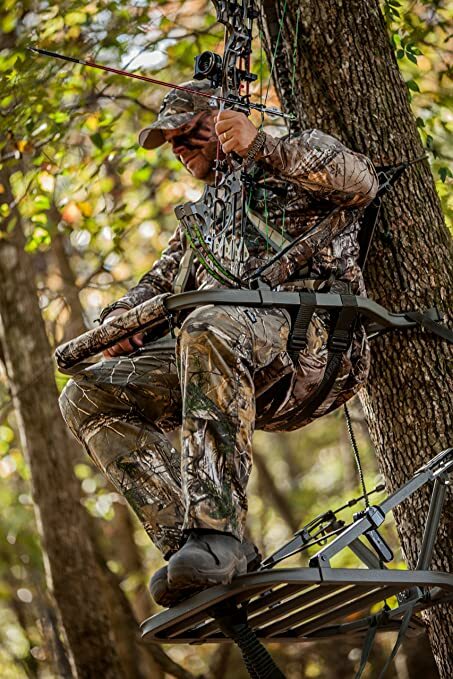 Climbing tree stand stands as one of the most exciting innovations to ever hit the bowhunting industry. This fantastic hunting gear makes it possible for you to take full advantage of the available hunting time by letting you combine your scouting trip with a surprise evening hunt (or even sneak into a new hunting area during the day, identify a spot, and climb a perfect tree). However, finding the best climbing tree stand can be pretty overwhelming. The market has an extensive variety of stands from manufacturers, with different features and prices. That being said, we have come up with this article to walk you through the factors you should consider when buying your climbing tree stand. (Plus we’ve selected the five BEST, top-performing stands on the market today). The first and the most important consideration to make before settling on any climbing tree stand involves your preferred hunting area. It’s obvious that this location will be having trees (otherwise you won’t be looking for a tree stand). So are those trees suitable for the climbing stand you wish to buy? The suitable tree for use with your stand ought to be fairly straight, with no low branches (the lower the branches, the more difficulties you’ll have trying to climb the tree trunk). You also want to ensure that the tree(s) has adequate bark that will enable your unit to dig in and attach itself securely. Feeling entirely comfortable when hunting is essential. Remember that you’ll be sitting in your stand for an extended period - which can make you sore or stiff. This will make matters worse when you try to haul your hunt to you truck with a sore back. Luckily, you can avoid such an awkward encounter by buying a climbing stand with a thick padded seat. This will let you feel comfortable and relaxed as you wait for that perfect moment to fire as shot! 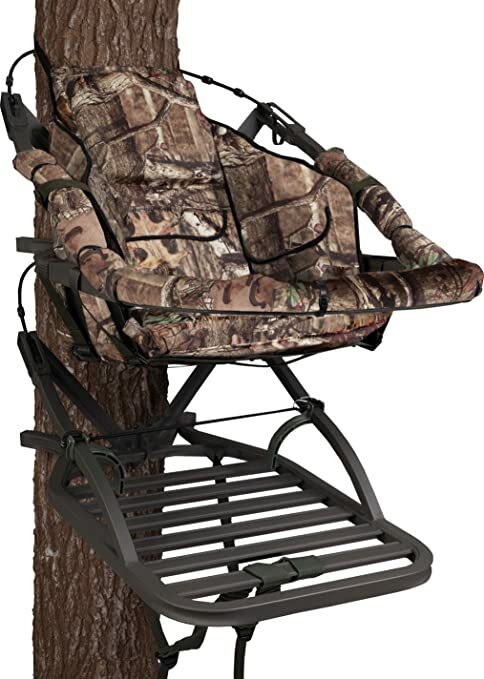 Furthermore, you can go for models that feature a backrest - this will make your experience in the tree stand even more comfortable. The right climbing tree stand should be capable of supporting your weight and that of your hunting equipment. Before heading to the stores, be sure to verify you’ll need the stand to accommodate. Some models can support up to 350 lbs of weight, meaning that most hunters can find a suitable stand for holding up their weight and that of their hunting gear. Just be a little research, and you’ll get the right deal. Safety should be your No.1 priority whenever you’re hunting. The last thing you want to get from your climbing tree stand is a near-death experience because it wasn’t sturdy enough to support you and your hunting equipment and you end up falling from 15 plus feet in the air. The surest way to keep yourself safe when using a tree stand is to go for stands with 3 or 4-point fall arrest systems (FAS). The system works by splitting your weight using different straps - making it easier for you to move in a safely secured manner. NOTE: Make sure that the FAS that comes with your stand is OSHA approved. The root of many treestand accidents is the hunter using the falling asleep. Thus, we also recommend you to consider a stand that comes with armrests as well to provide you with a safer area to sit in. As an experienced hunter, you know that you don’t have to limit your activities to the forest edges only; you’ll need to get deeper into the woods to get more favorable hunting zones. Unfortunately, you can’t drive into these areas. And that means you’ll have to carry your stand all by yourself to the favorable hunting spot. 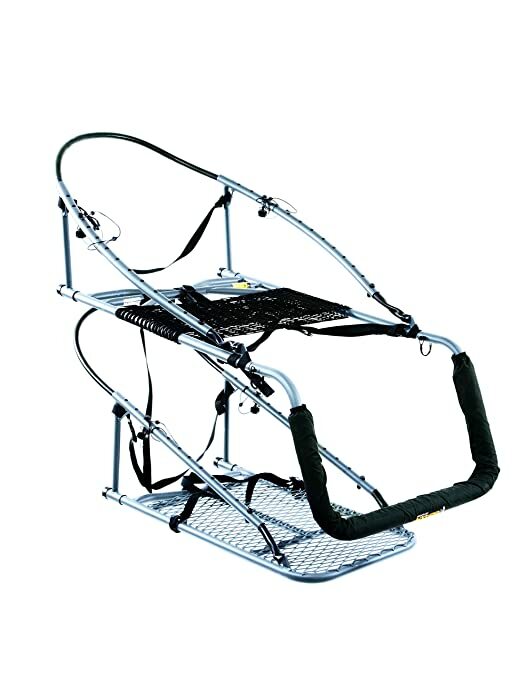 As such, you’ll have to consider a highly portable climbing tree stand - one with an incredibly lightweight design - so that you’ll have an easy time transporting it to your hunting spot. The material used for the stand construction should be able to endure inclement weather, dew or frost. It should also be able to hold up to the standard tear and wear that might occur as you continue using your stand. Opening our lit of the best climbing tree stands is the. 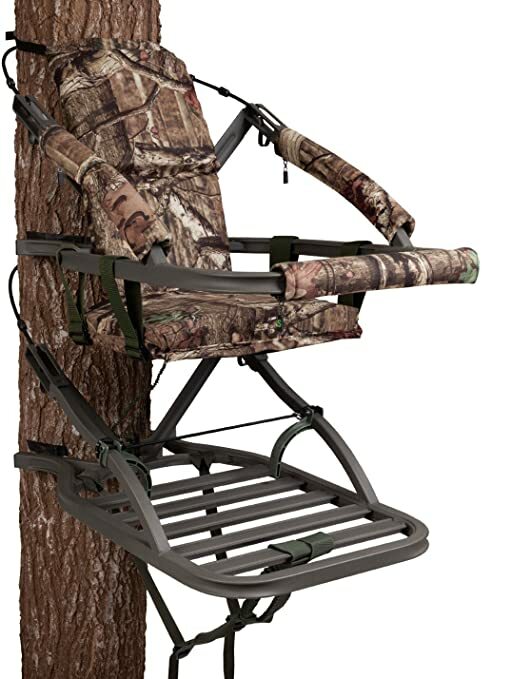 Summit Treestands Viper SD Climbing Treestand. The Viper SD presents you with a fresh way to survey your hunting region while you stay safe high on the trees. One thing about this bag that’s driving every hunter crazy is its portable nature. The stand is incredibly lightweight so it doesn’t feel bulky. 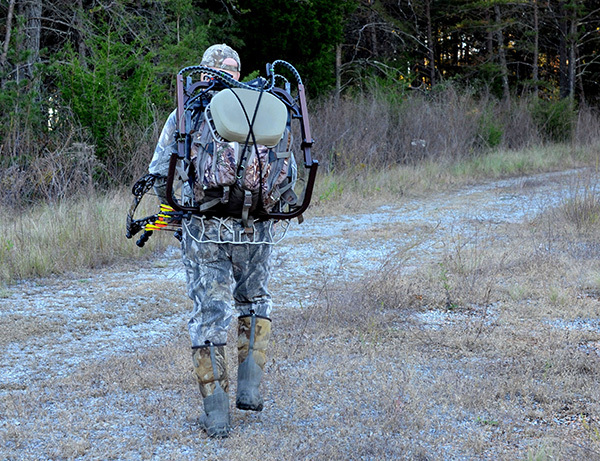 Besides, it comes with backpack straps for convenient transportation to your hunting zone. Absolutely the perfect match for bowhunters, this stand comes with a Mossy oak camo pattern that’s completely difficult to detect for your target game(s). The unit features the legendary DeadMetal Sound deadening technology that reduces the noise produced when in use. This technology achieves a noiseless operation by filling the critical parts of the platform with specialty foam that expands to dampen the undesired noises when you move with your stand. Additionally, the QuickDraw Cable retention ensures a quiet and fast cable attachment systems that’s incredibly easy to maximize. Incorporating a 5-channel aluminum platform frame, this stand guarantee sufficient support for you. It features the SummitLokt precision welding which employs extruded aluminum alongside exclusive precision welds - resulting in a product of superior toughness and strength. With the ergonomically designed RapidClimb stirrups that can easily accommodate any boot size, you’ll have an easy time climbing any tree. The four point fall arrest system ensure you’re safe when climbing or getting down from the trees. The backrest boosts the comfort offered by the foam seat. This is an incredibly lightweight stand (weighing 21 lbs. ), capable of supporting up to 350 lbs. of weight. Measuring only 32”L x 25” W x 5” H, the stand is quite compact. And you can make it even more compact by quickly folding it into a 5” pack. This makes it real easy to attach it to the included backpack straps and easily transport it through the woods. One thing I like about this climbing stand is its suitability for use with most trees. That is, it easily mounts on trees with trunk diameters as small as 6 inches and as large as 19 inches. When it comes to durability, this stand ranks among the most durable as it’s constructed from a heavy-duty aluminum material. The fact that the same material is rustproof makes your unit stand the test of time. Bearing a gray camo that matches the surroundings of your hunting zone, this stand goes a long way in hiding your location. The stand comes with a padded that makes you feel comfortable as you wait for the perfect shooting moment. If stiffness catches up with you while up there, this unit’s platform is large enough such that you can stand and stretch a little. To ensure you’re completely safe while in this stand, it comes with a 6-point harness system that safeguards you against all possible falls. The treestand comes with a 1-year warranty that covers the replacement and repair costs within the first 12 months ownership. This particular stand from Summit comes with some unique features that qualify it to appear on our list. One of the features you’ll fall in love with is the height-adjustable, reversible, surround seat. This proves to be a huge plus for your bow sessions as it lets you use the tree trunk as your weapon rest. Besides, this unique seat design allows you to use the tree trunk to cover yourself when you feel too exposed (probably due to the absence of foliage in your hunting area). Because of its size and comfort, this chair will provide you with maximum comfort that will keep stiffness at bay. The Mossy Oak pattern all over the stand not only makes the treestand look great but it also ensures you remain undetectable in your hunting stand. The unit weighs approximately 23 pounds, yet it can support a whopping 350 pounds! The tale gets sweeter when you realize that this stand can fit smaller trees - starting from 8” - and larger trees - starting from 20.” The platform is longer compared to most models out there, giving you some piece of mind as you pivot while doing full draw. This tree is highly durable and will serve you for a lifetime. It’s constructed from extruded aluminum. And all its parts are precisely fitted together before welding takes place - through a technique known as SummitLokt. This unique craftsmanship reduces stress on the weld and prevents your stand from making noise whenever you shift your weight. For improved strength and safety, this stand comes with an extra channel brace on its platform - making the total number of channels to be 6. High weight capacity, 350 lbs. At only 18 pounds, this stand features among the lightest models on the market today. But don’t this lightweight design fool you. The Cobra SD has been engineered using the sturdy extruded aluminum metal as with other Summit Treestands. Featuring a five channel platform frame, this stand offers you a strong, durable hunting environment for many seasons. 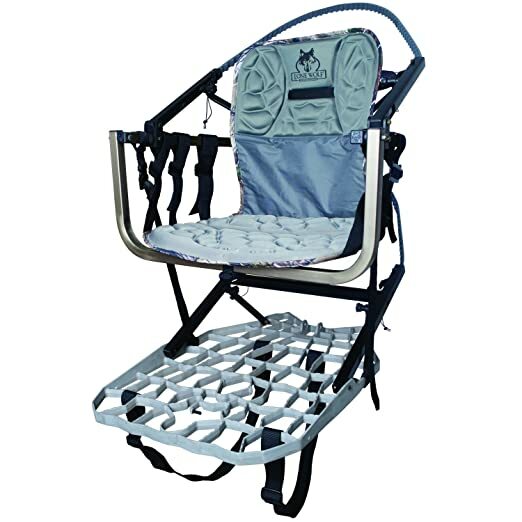 The padded seat will keep you comfortable and relaxed for long hunts. One particular thing that caught my attention in this stand is the ability to raise the padded seat (perfect for archery season) and lower it (ideal for the gun season). With Summit’s Patented Dead Metal Sound Deadening Technology, you’ll use this stand without producing any noise that might distract your target buck. We also can’t fail to mention the QuickDraw Cable Retention System and RapidClimb climbing stirrups that make the entire system easy to use. The Cobra has a weight limit of 300 pounds. It features Mossy Oak camouflage pattern that blends well with late fall, early winter foliage - ensuring you remain undented by your target game. The Ol Man Multi Vision Steel Tree Climber is a favorite for most bow hunters. This is mainly because it comes with safety bars that encircle you perfectly well as you draw your bow. This would be particularly useful to bow hunters who always worry about their bow limb bottom or cam coming into contact after they release. You’ll like the versatility offered by this stand. It lets you discard the rail it originally comes with and replace it with a curved bar that acts as foot rest (or gun rest when you flip it over). Constructed from heavy-duty steel metal, this stand will be your hunting companion for seasons to come. Because it’s a relatively compact, no-frills stand model, it guarantees you of a quiet operation. 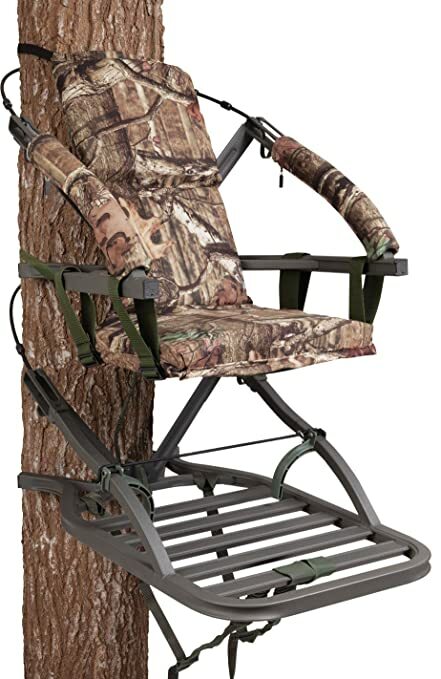 Incorporated with the ComfortTech Mesh Seating, you’ll feel comfortable while in the stand. The unit weighs around 29 pounds and has a weight limit of 300 lbs. 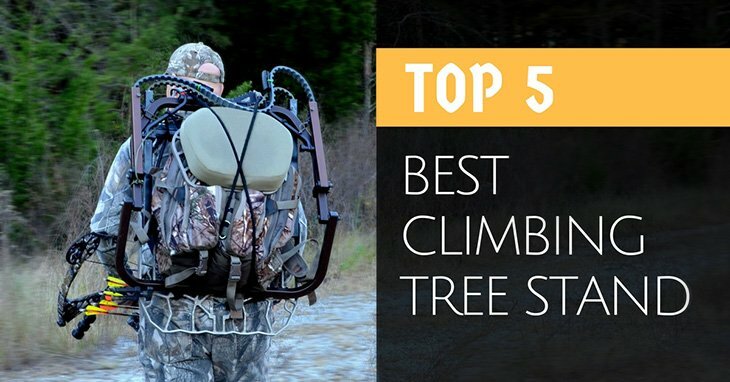 These are our five BEST picks for climbing treestands. Clearly, Summit Treestands Viper SD Climbing Treestand has got what it takes to stand among the other four stands. It has lots of impressive features and excellent performance, not seen in the other stands. Among the most notable features in this particular stand include top-rated portability, foam seat with backrest for the ultimate comfort, four point safety harness system, sturdy construction, RapidClimb for easy, fast climbing, noiseless operation - and so much more. If you want to take down that monster buck you’ve been targeting from a tree top, this is the perfect climbing stand to make your wish come true. RELATED: What Is The Best Drop Away Arrow Rest On The Market?